Hi Rosemary! Thank you so much for searching for me! I actually not too long ago replaced my son’s pig belly with new fabric that he picked out at the store. I was so nervous that I would “ruin” it for him, but he seems to like it even more! You can go ahead and take me off your searching list, as I think he is content with this one now. Once again, thank you so much for trying to help me! Take care. Hi there! 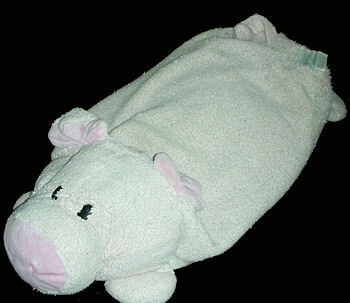 I’m looking for a pink, stuffed pig (lovey) for my son. It’s about 2.5 feet long, kinda like a pillow. If I can remember what my son’s tag said was that it was a “Mushables” brand?? His tag no longer has the words on it, because he rubs it nonstop! The belly of the pig is really thin now and is about to get a few holes in it. I would love to get him another one before this one wears out! He would be devastated! If you could help me, that would be wonderful!! I think this is what Kelly is searching for. I sent the link to yasmerry. Thanks! I am looking for this pig too. If anyone knows where to find one that would save me. My daughter loves her ” Piggie” and can’t sleep without it. It is getting pretty ragged and torn.